Type 2 Diabetes is a huge medical problem facing our country and the world. These 1 our of 9 people are more likely to die younger, have stroke, heart attack, blindness, amputations, kidney failure, fatty liver, erectile dysfunction, depression and complications of pregnancy. That leads to us spending $1 out of every $5 for Diabetes care! And, what is more scary is that if the current increase in Diabetes continues, by 2050 1 out of every 3 people in the U.S. will have the disease. That will have very serious consequences for those people and their families and for our country as a whole. Please read more on how you can help stop this trend for you and your family! This is an important question to ask given the current trends. Often people think someone needs to be significantly overweight to have Type 2 Diabetes. This is highly INCORRECT. There are actually plenty of morbidly obese people without Type 2 Diabetes. Larger waistline- 35 inches or more in a woman and 40 inches or more in a man. If you answered yes to any of these- sign up for our seminar and stop the train, say no to developing Type 2 Diabetes! The problem is hormonal balance, how much central body fat you have and ultimately how your body processes sugars. These factors are determined by your genes and your environment/lifestyle. And, to be clear ALL carbohydrates are broken down into sugars by the amazing machine of your body. Can you be "cured" from Type 2 Diabetes? 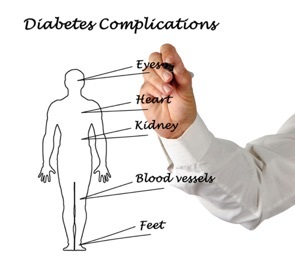 What does that mean for those of you at risk or currently dealing with Type 2 Diabetes? It may not be fair, but, hopefully one of your parents explained early on that life is not fair! You have to take control of your health NOW and for the rest of you life. Your body is AMAZING and is trying to do the best it can to help you life a long and joyous life. AND- your body needs your help. It needs you to understand what it requires to operate like the Ferrari that it is and take care of it as you do your most prized possession. You only get one body for this lifetime. Get educated about what it needs and take charge of your life! The time is now- sign up for Diabetes Smackdown to get the tools needed to make lasting changes in your health.